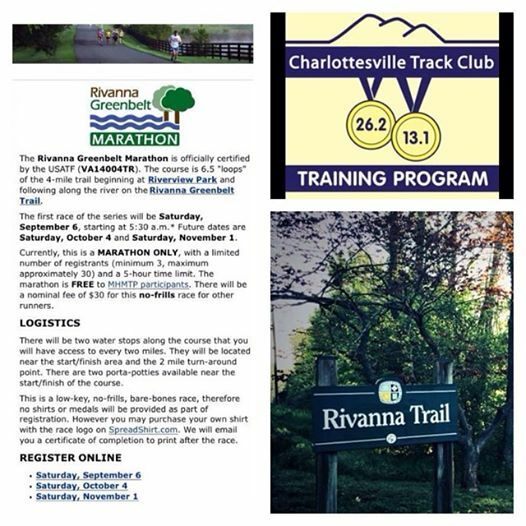 The Rivanna Greenbelt Marathon is officially certified by the USATF (VA14004TR). The course is 6.5 "loops" of the 4-mile trail beginning at Riverview Park and following along the river on the Rivanna Greenbelt Trail. Future dates are Saturday, October 4 and Saturday, November 1. Currently, this is a MARATHON ONLY, with a limited number of registrants (minimum 10, maximum 30) and a 5-hour time limit. The marathon is FREE to MHMTP participants. There will be a nominal fee of $30 for this no-frills race for other runners. There will be two water stops along the course that runners will have access to every two miles. They will be located near the start/finish area and the 2 mile turn-around point. There are two porta-potties available near the start/finish of the course. PLEASE NOTE: A minimum of 10 participants is required for this race. If we do not meet the minimum number of registrants within 21 days of race, we will need to cancel the event. Refunds (minus a small processing fee) will only be issued if the event is cancelled due to a lack of registrants. Volunteers are essential to the success of this race! We need volunteers to help document splits at each of the three turnarounds. We also would like volunteers to help with setting up and managing the water stops. Depending on the success of the initial series, we may consider expanding this event to include offerings in December 2014 and Spring 2015. Sign up to be on the mailing list for future dates. *Start time subject to change, but will be no later than 6:30 a.m.